Project: K.I.T.T. 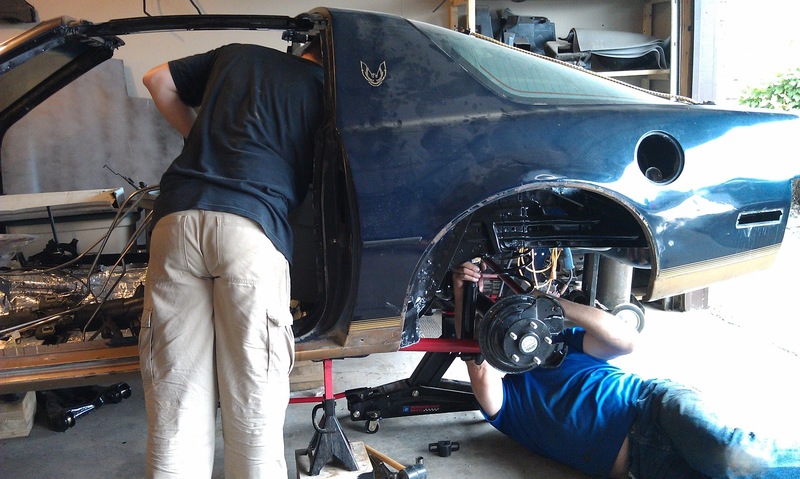 : Installing KITT's Rear End! 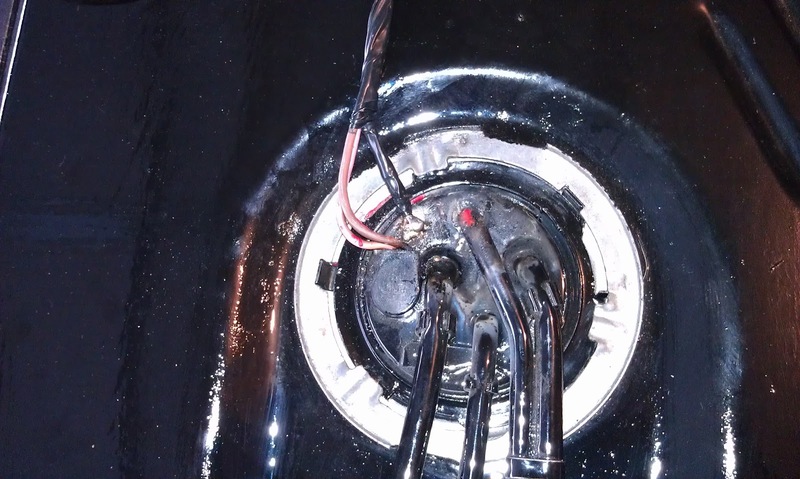 Troy slid the lock ring over the fuel lines and into place. 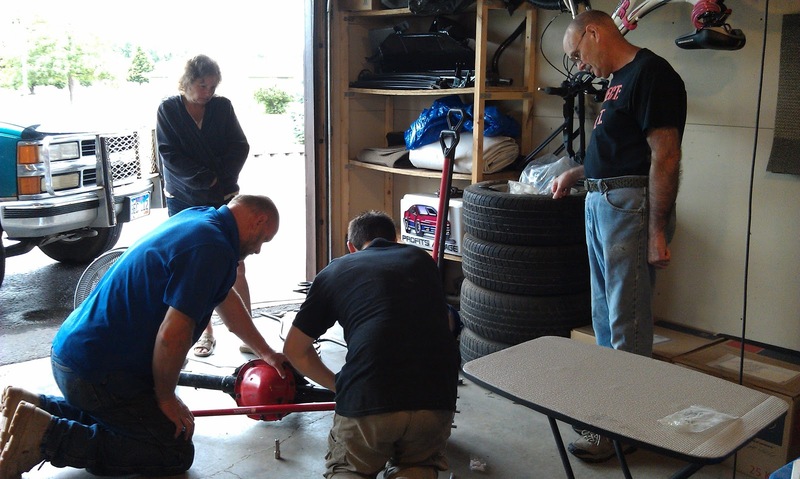 We used a screwdriver and rubber mallet to lock the ring. Sara and I looked everywhere for the rubber grommet that held the fuel lines together as a group but apart from the tank. I think the main purpose of this grommet is to insulate the lines from the tank so they do not rattle. We could not find the grommet. I will either have to locate it or come up with something different to insulate the fuel lines. 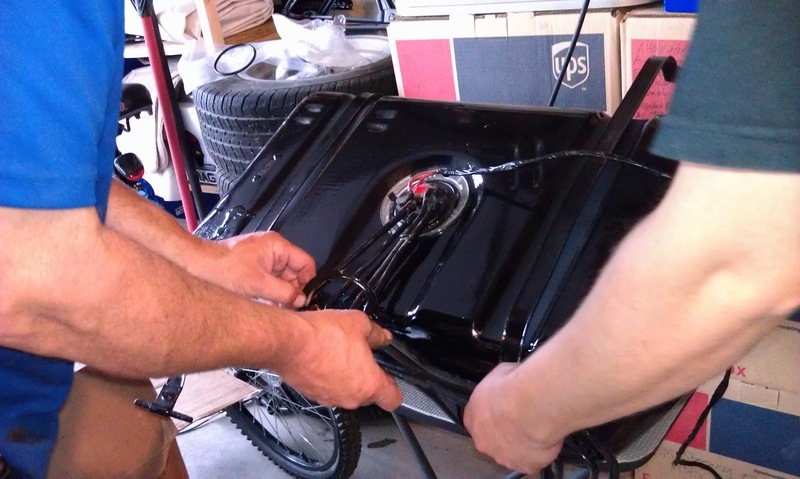 I helped Troy carry the rear end from the back of his pickup into the garage. 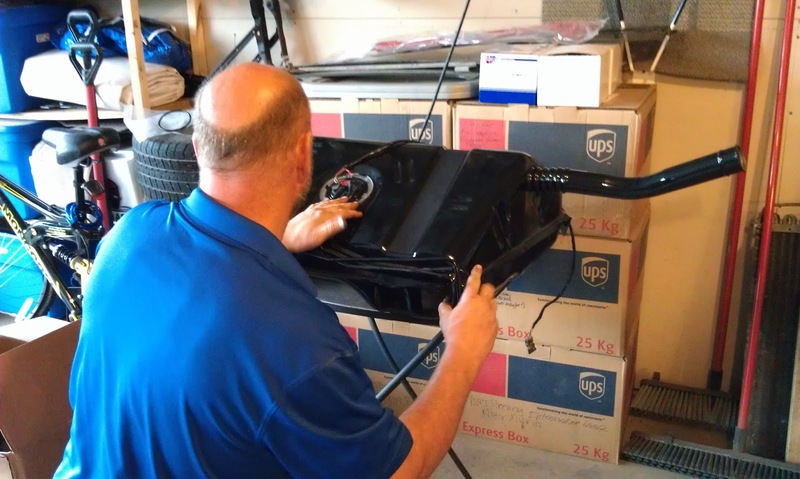 Troy had to run back to the shop to get his butane torch and soldering iron to solder the ground wire to the top of the fuel sending unit. It came off when we were installing the fuel sending unit. Before Troy left, I showed him the cross-fire setup. He took it with him back to the shop. 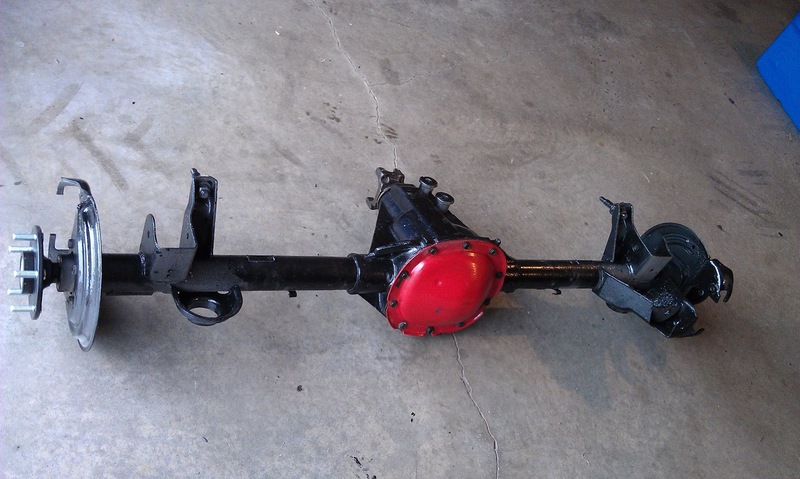 Here is the completed rear end. 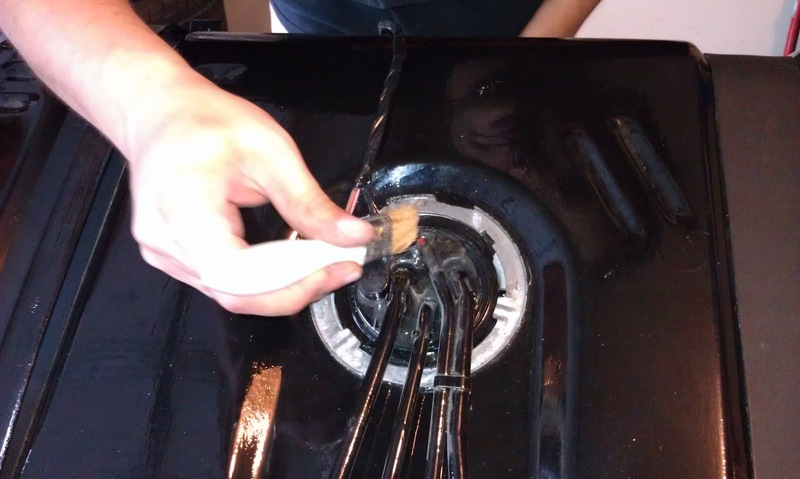 When Troy returned we soldered on the ground wire. 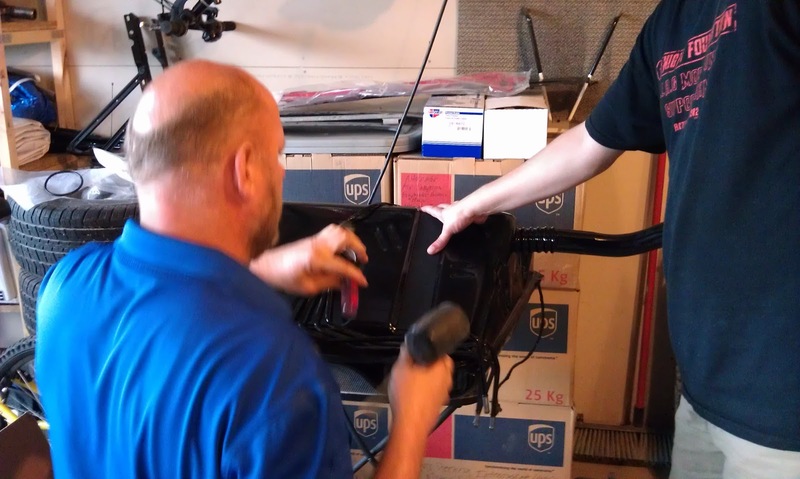 Then I wrapped the leads in electrical tape. Because of the braising Troy had done to the top in an attempt to reattach the ground wire originally, I needed to re-coat the top with more POR-15. Instead of opening a can, I just used some POR-Patch. 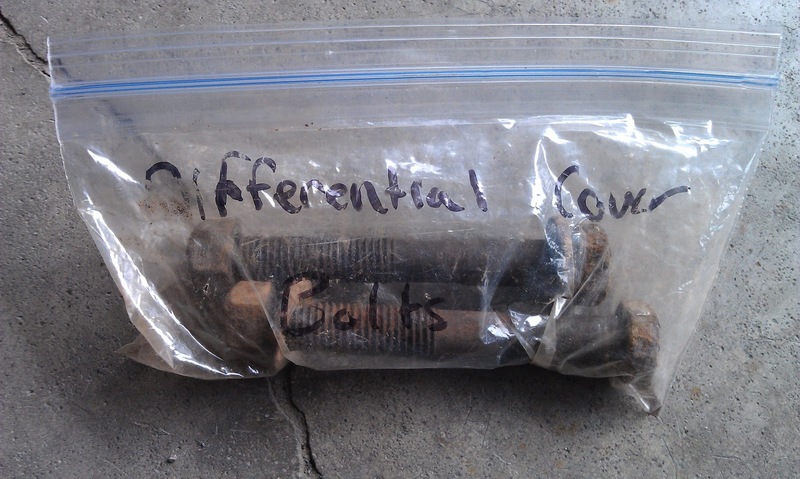 I knew it would protect just as well and it should never be exposed to the elements anyway. I installed the clip nuts for the gas tank straps on the frame. 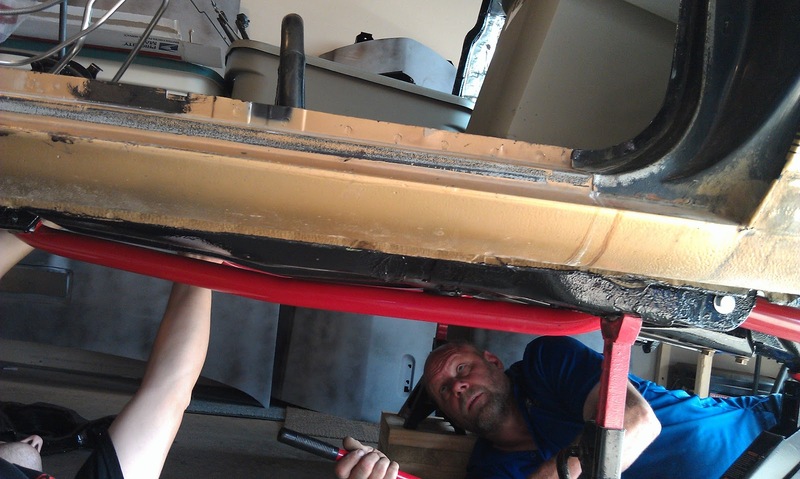 Then Troy positioned the gas tank into place while I guided the fuel filling neck through the holes in the frame. 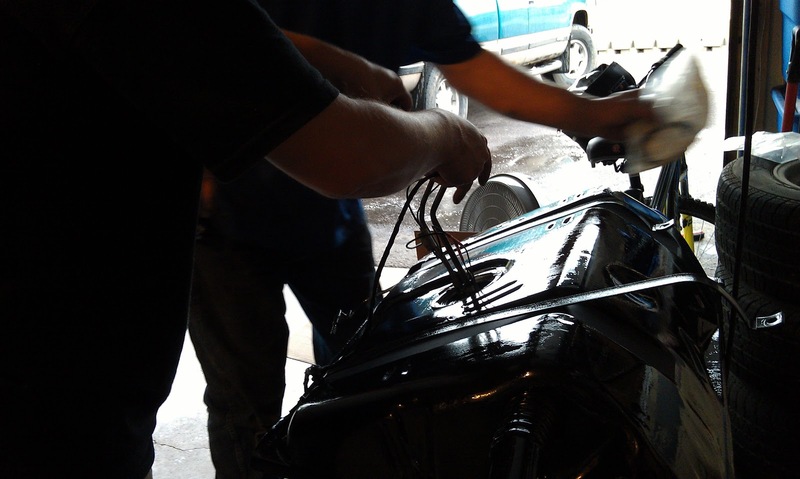 Once the fuel tank was in place, we attached the straps and bent them into the correct shape. Then we bolted the straps down tight. 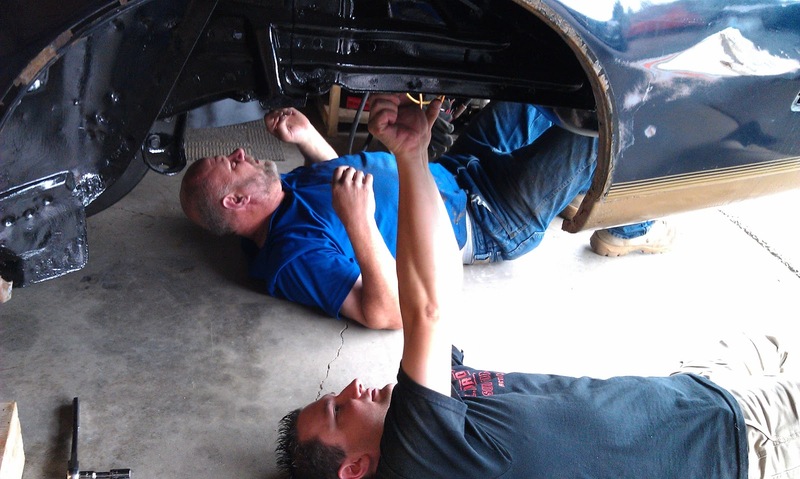 Troy held the Panhard/track bar brace in place and put the bolt through on the passenger side. I bolted up the driver side. 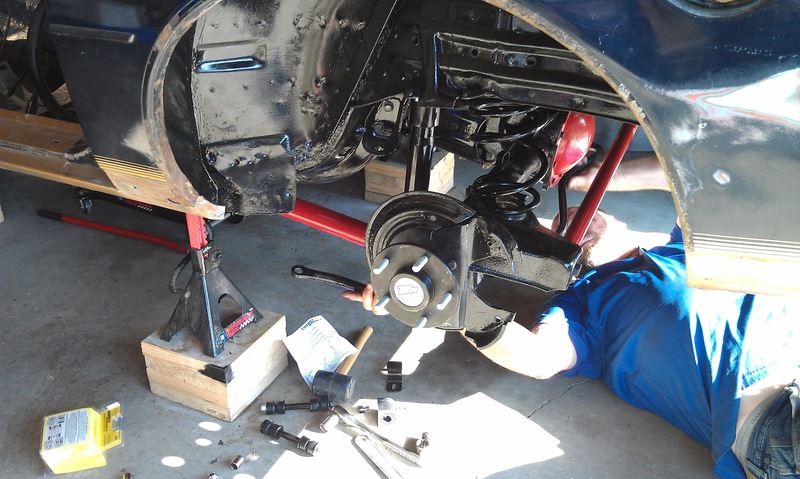 The new bolts for the Panhard/track bar were a little larger than stock, so I needed to enlarge the holes on the rear axle. 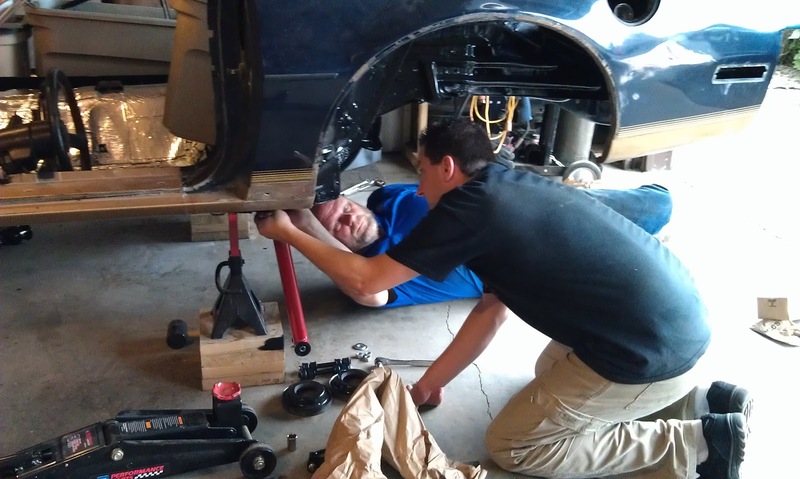 Troy's wife helped steady the rear end for me so it did not slide while I was drilling. 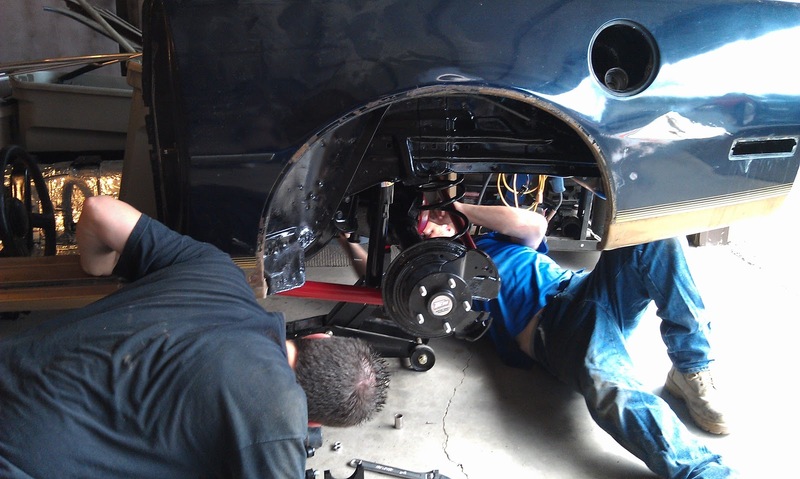 Next we attached the lower control arms on both the driver and passenger sides using the new hardware we purchased. 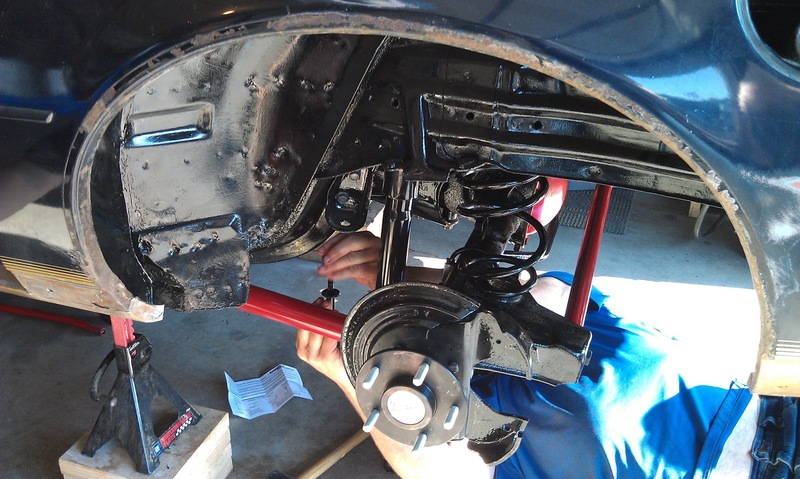 I put the Panhard/track bar into place on the rear axle and bolted it in. Dad and Troy's wife were on hand to help. 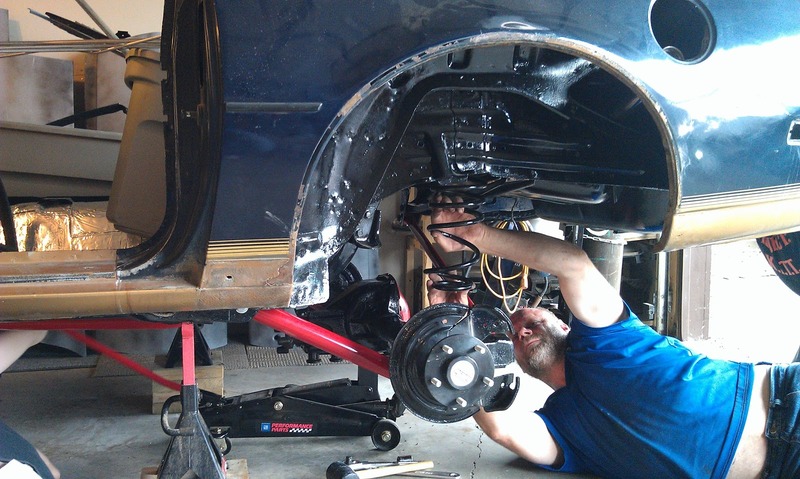 With the Panhard/track bar attached, we moved the rear end under the car and used the jack to raise it up. 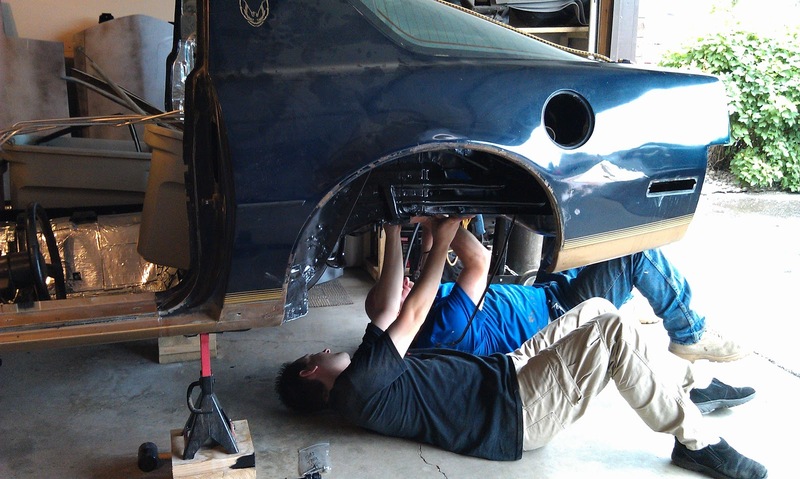 Then we attached the lower control arms to the rear axle. 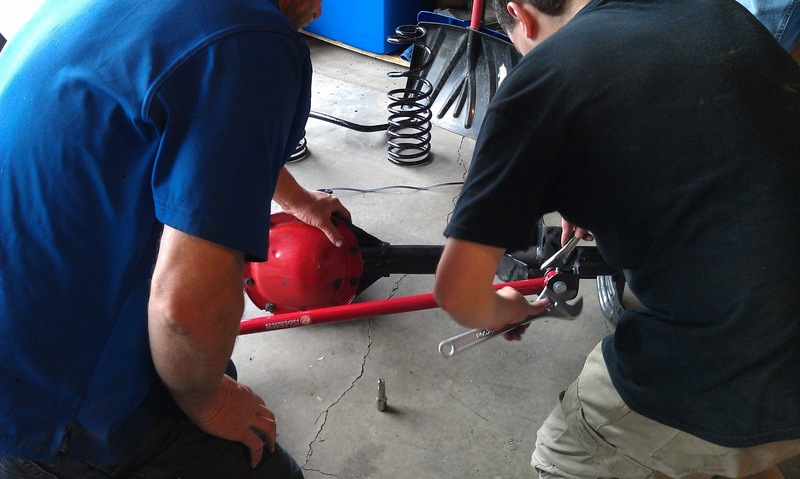 In the process of bolting the Panhard/track bar to the frame, we discovered that we had used the wrong bolt to attach it to the rear axle. 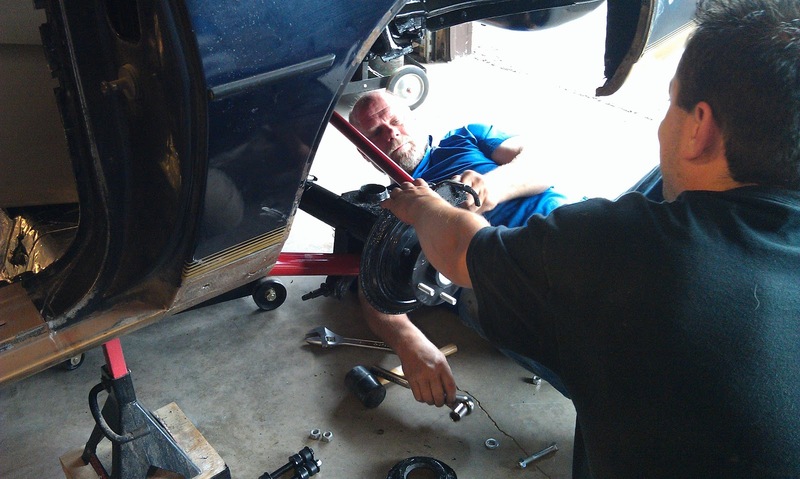 I must have grabbed the wrong bolt because we did not have the one we needed for the passenger side lower control arm. 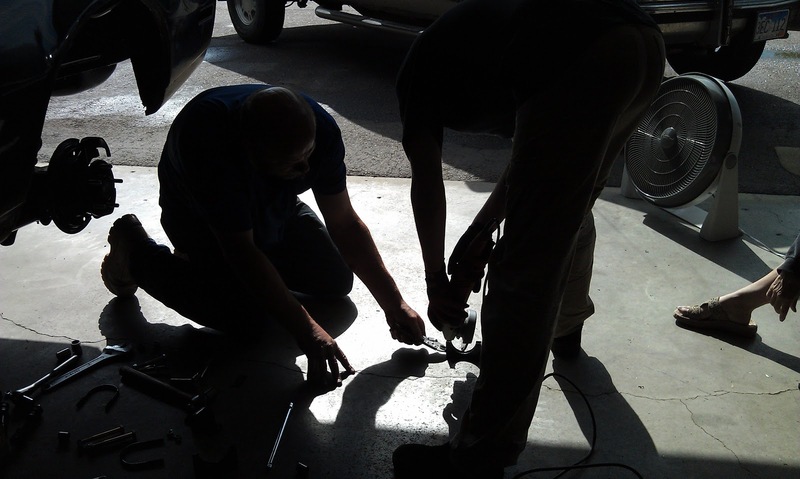 We installed the correct bolt and were quickly back in business. 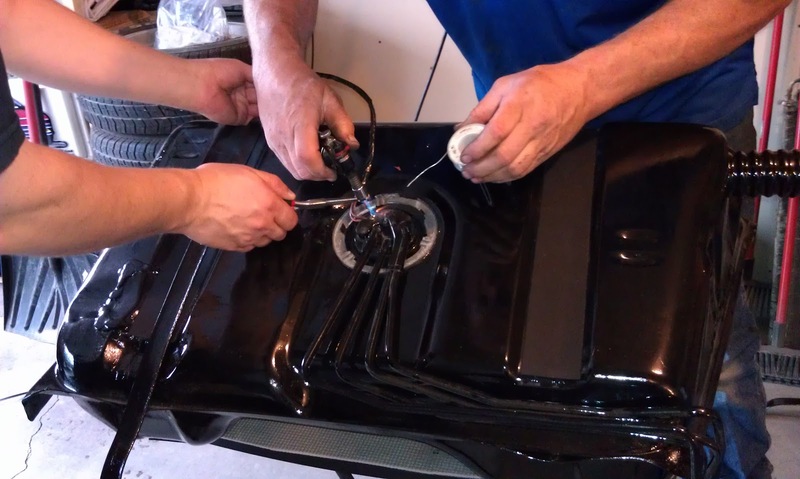 Next we installed the springs. 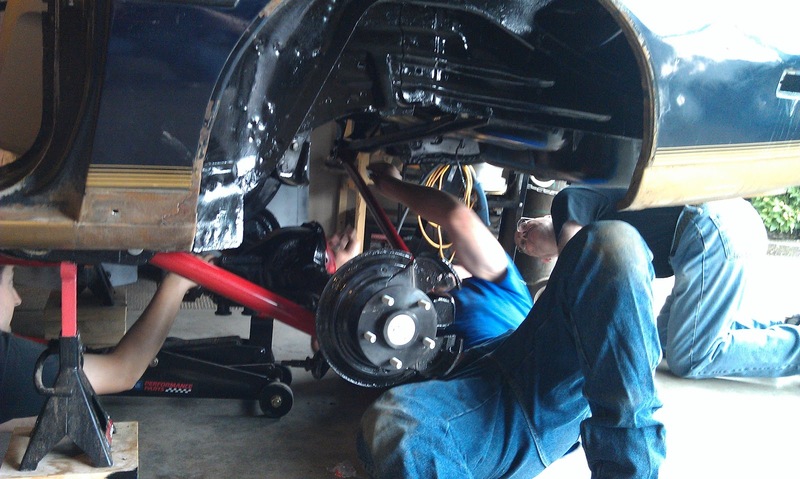 Troy put them in place while I jacked up the rear end until it held the springs in place. 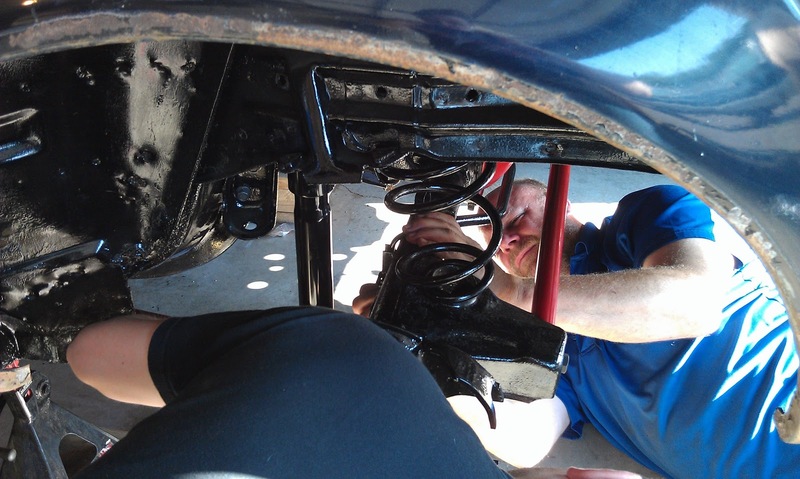 We installed the shocks next. Troy held them in place. I bolted them up from the inside. 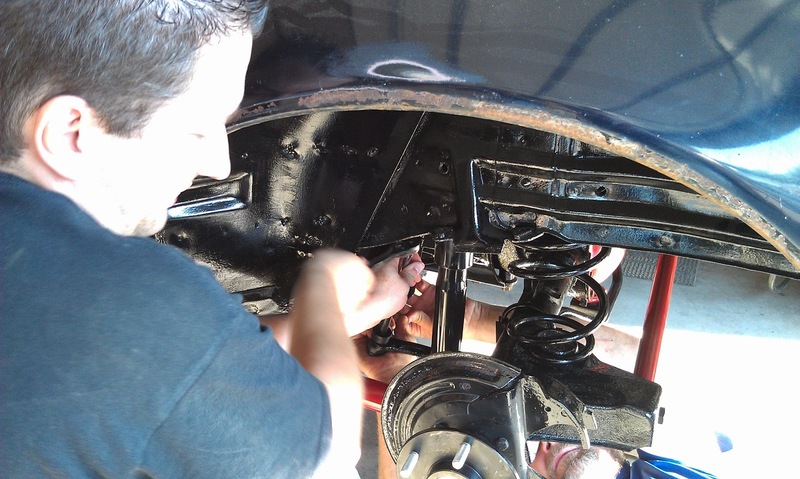 We installed the nuts and washers for the rear shocks. 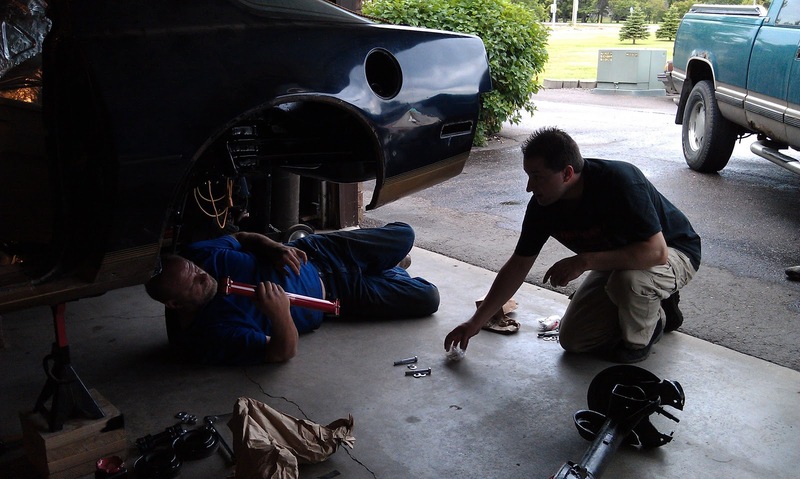 Then Troy mentioned we really should install the torque arm to help keep the rear end from turning up. 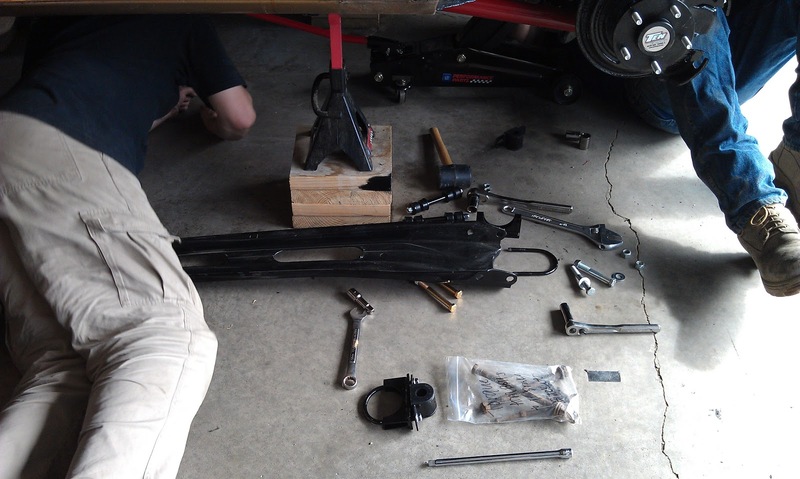 I was planning to replace the two bolts used for the torque arm, but I had not done so yet because I did not realize this needed to go on now. 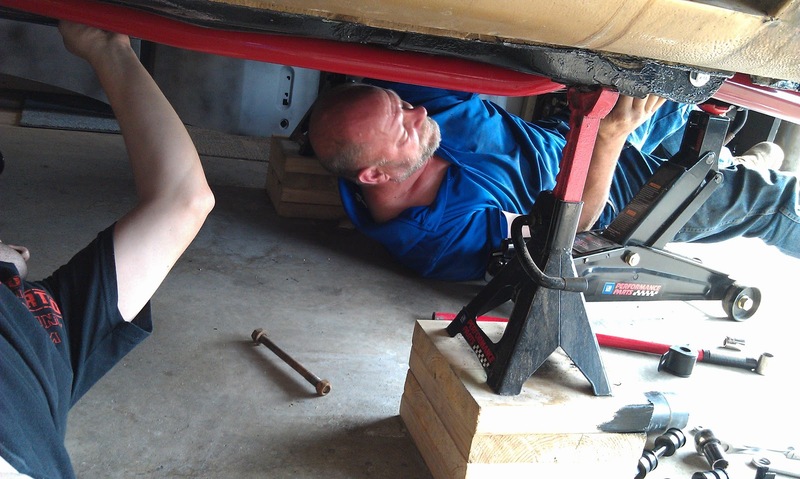 Sara found the torque arm bolts and Troy and I used the jack to get the rear end in the right position for installation. 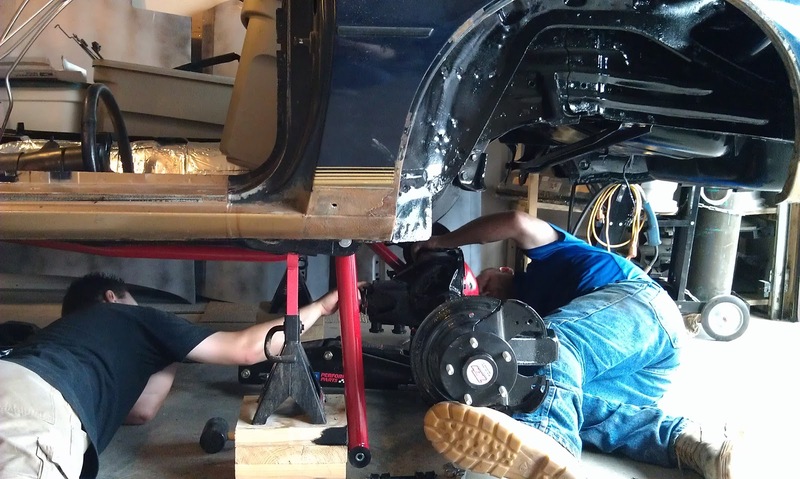 I wrapped the end of the torque arm in a rag to protect the underside of the car and then held the torque arm steady while Troy bolted it in. 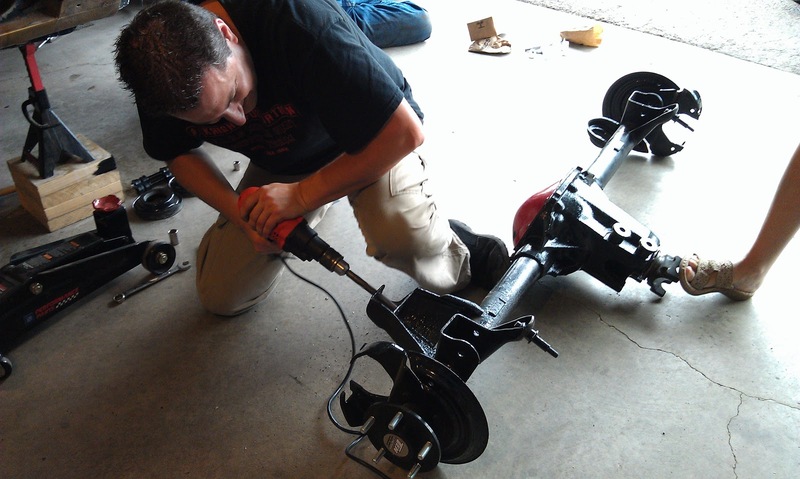 With the torque arm bolted on, Troy slowly let the jack down and we let the torque arm rest against the top of the transmission hump. 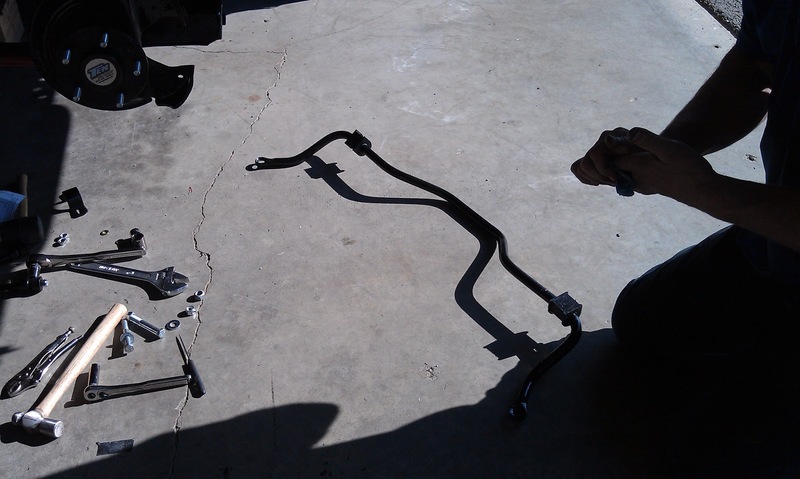 The next item to install was the sway bar. 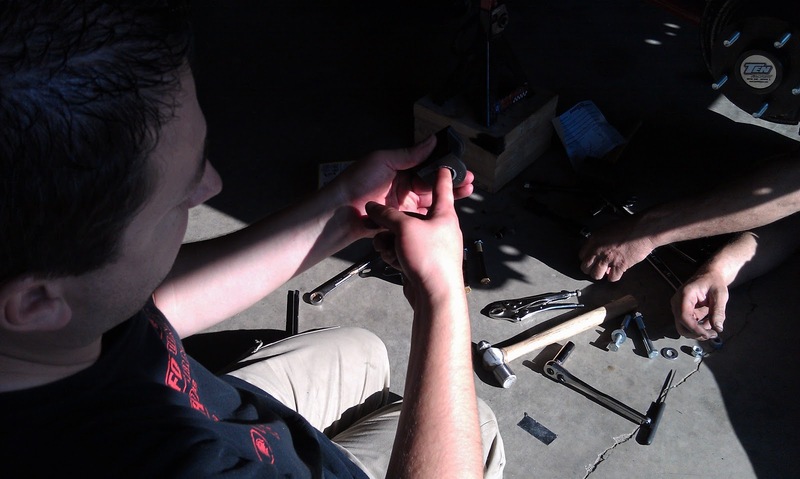 I forgot that we needed to notch the custom brackets we made for the sway bar bushings. 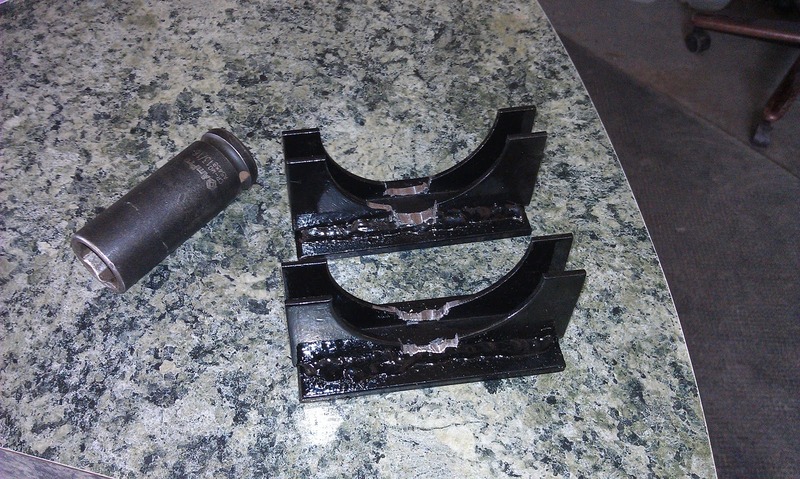 I attempted to use an angle grinder, however I could not get the grinder to fit between the brackets. We ended up running down to Troy's shop to use his die grinder. We also grabbed a socket I would need to tighten up the bolt for the Panhard/track bar. 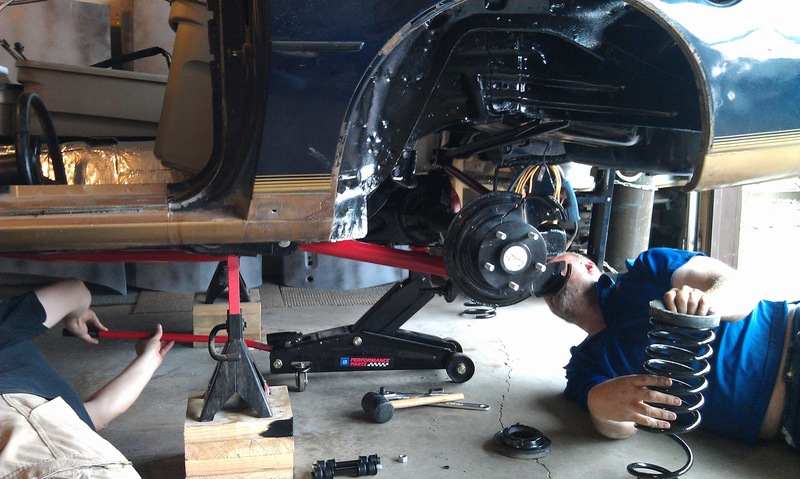 I used the supplied grease from Energy Suspension to lube the inside of the bushings. 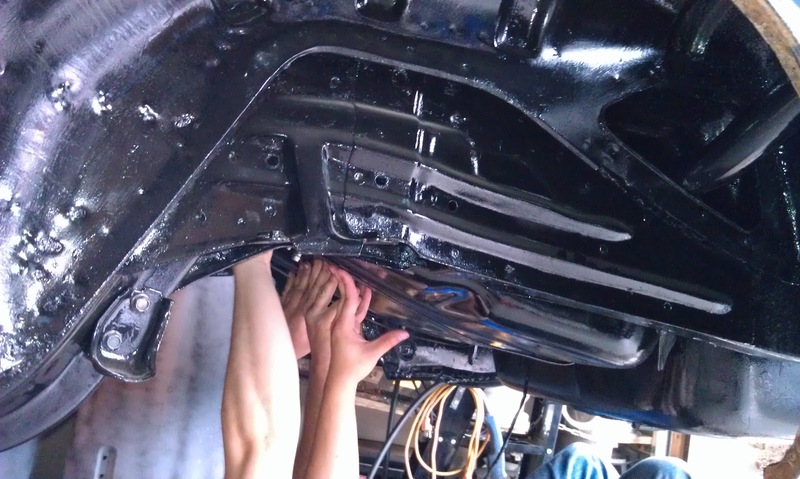 Troy did a test fit of the brackets we made. 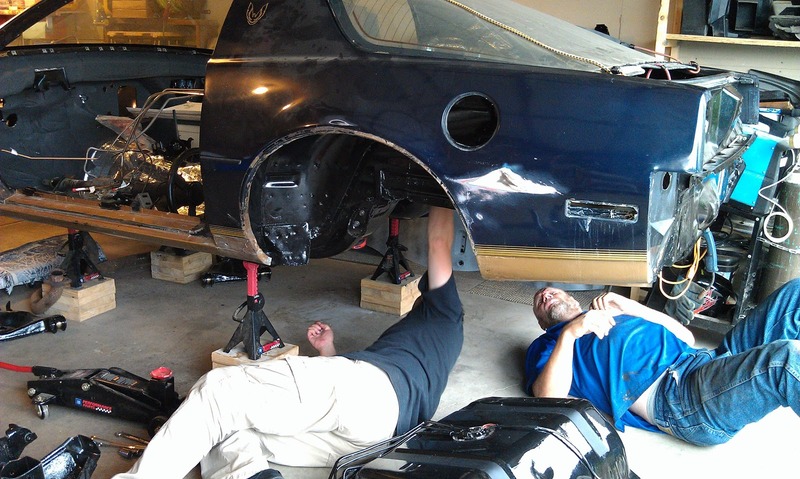 We slipped the bushings over the sway bar. 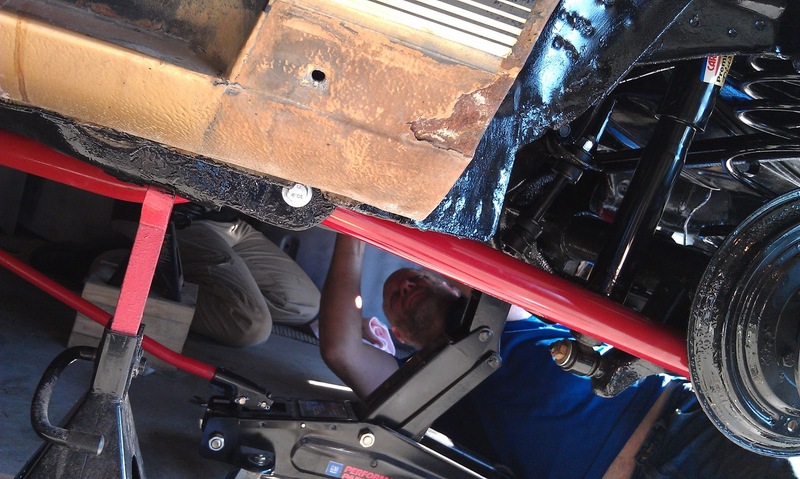 And then we installed the sway bar. 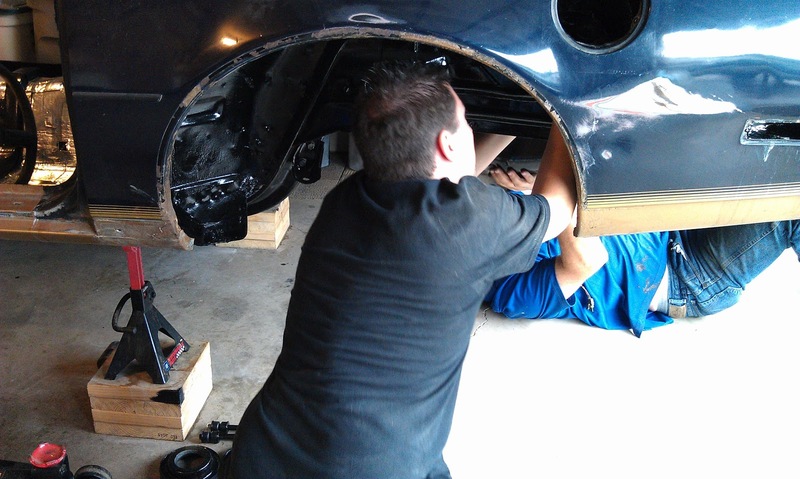 Troy worked on the passenger side and I worked on the driver side. 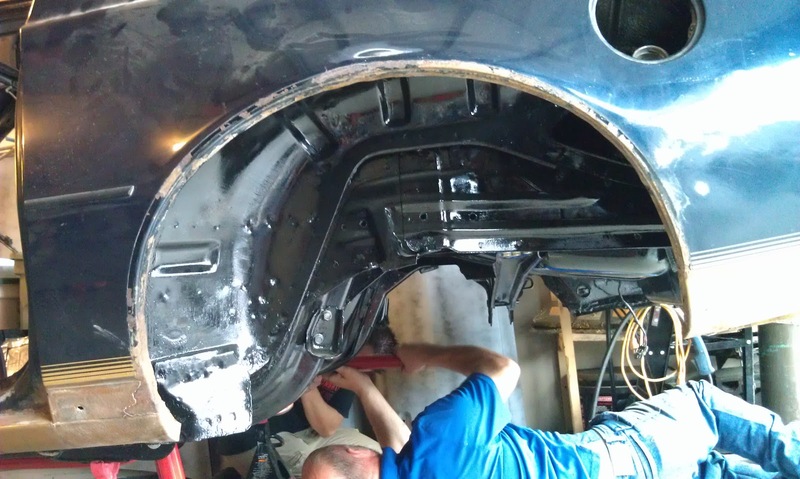 Next to install were the end links. Troy assembled them and put them in place from below. I tightened them down from the top. This is the driver side. 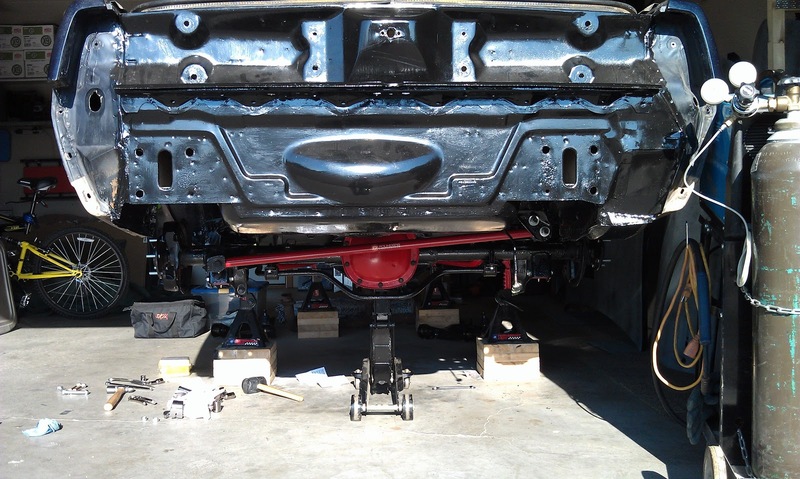 We finished up the rear end install by installing the passenger side end link. Before Troy left we discussed our next plan of action. 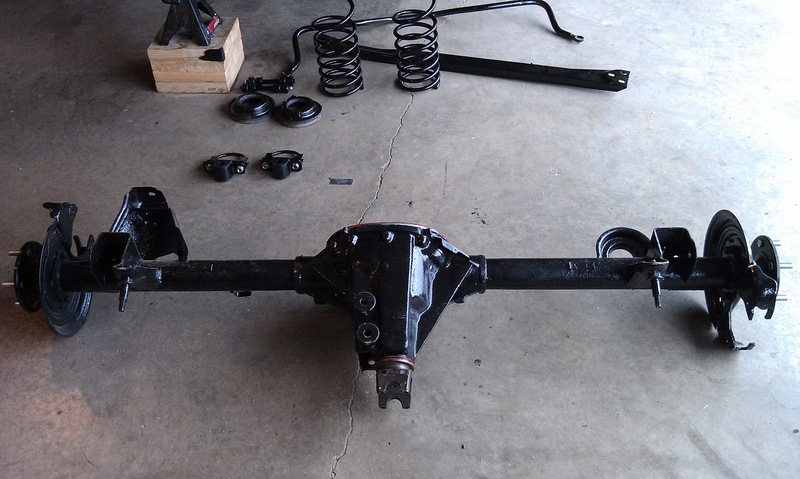 I plan to get the A-arms, the spindles, the strut mounts and the front steering linkage installed. 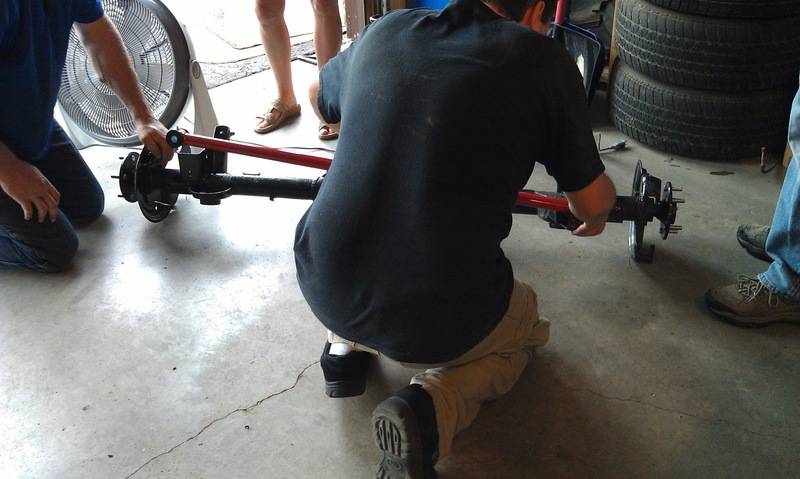 Troy said he would bring over a spring compressor to help install the front springs and struts. He has the rotors on order and they should be here this next week. 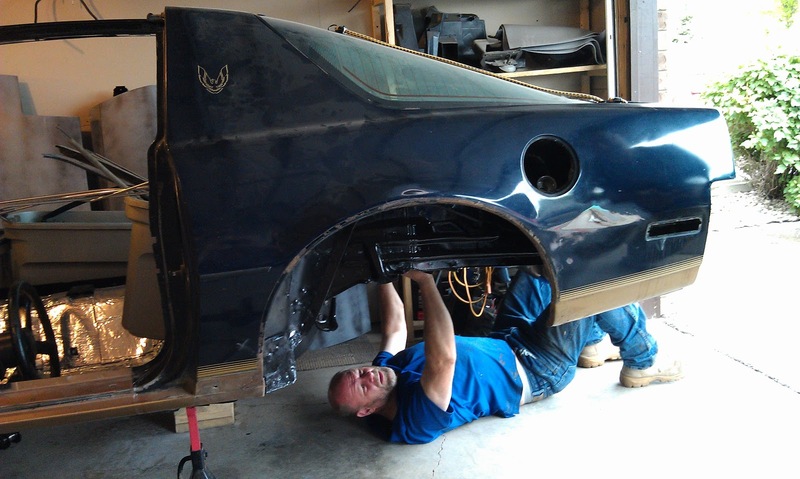 KITT should be on his wheels by next weekend! 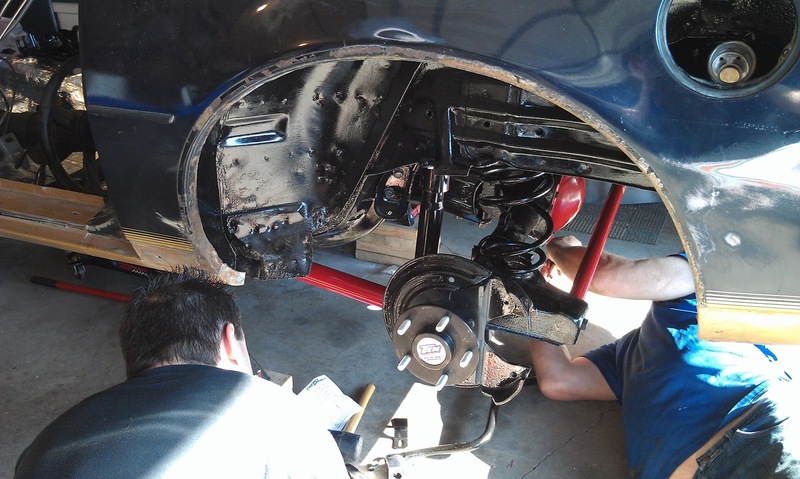 KITT's newly rebuilt rear end!